I set a goal for myself at the beginning of 2016 and I been very diligent this year about posting every Monday, usually with a new project to share, and in total I made 42 things last year. That's about 10 pieces per 12-week season. I really enjoyed the structure of "a new item every Monday" but I think I'd rather cut back a little. 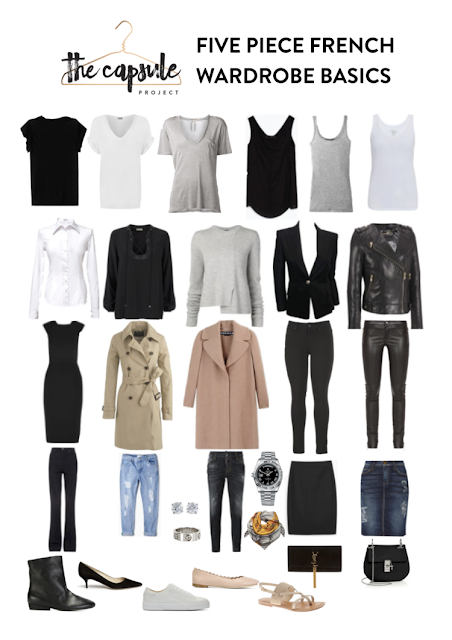 typical five piece french wardrobe basics--but not necessarily mine!! The idea of the Five Piece French Wardrobe (FPFW) is a popular one in capsule dressing: you pare down your closet to basics (which can be anything but are generally the standard white blouse, black pants, dark denim, trench coat, etc.) and then limit yourself to 5 purchases each season. If you're limited to only five things, you're more likely to buy higher quality items that you really love, and not settle for something that's not exactly what you're looking for. I'd like to steal this idea and make 6 or 8, not 10+, items a season. That means two or three new items a month, instead of 4. This should give me time to work on fitting some repeatable patterns, and use up some of my stashed fabrics--there's a few absolutely gorgeous lengths I have, and I know what I want to do with them, but I just haven't had the time to devote weeks to those projects! Like, I've been talking about making a blazer and a tailored coat for ages and not gotten around to it yet. I'm sure there will always be fun, shiny distractions and simple projects to crank out in a weekend, but I'd also like to actually make that blazer, too, so I think aiming for a FPFW mentality will be a positive step. a special surprise project (more on this soon). I'd also like to make a first version of the Sewaholic Granville shirt. I mentioned in my shapes & silhouettes post that I wear my Ralph Lauren oxford cloth button downs frequently, and I'd love to have a hand-made alternative that I can make in any color I like. And speaking of colors... did you notice all those future makes fit nicely in my capsule color scheme? (Even the pajamas are cream with coral and pink flamingos!) Finally, I also said I'd like to make about 6-8 items, so I still have a little wiggle room if something pops up that I have to have, like pattern testing or a new release. This would be way too much stuff to take on if I were still going to be trying for a new item every Monday, but I should be able to get a bit more done now that I'm not worried about making lots of new new new. Instead, I'm thinking of introducing a little bit of lifestyle content, and trying to revive my "what i wore" posts featuring older makes styled differently (like the one I posted this week). Let me know what you think of these as they get going, I always appreciate feedback. Have you ever heard of Five Piece French Wardrobe or tried this method of capsuling? I'd love to hear what you think! What would be your basics? your first five pieces? ps: continuing the FPFW thing, I'd also like to "invest" in a few high quality accessories once I have a few items of capsule clothing resting comfortably in my closet. a lovely French reader contacted me after my Louis Antoinette post and in chatting about French style, she mentioned two things the French do exceptionally well: classics, meaning lots of neutrals, and coordination, matching their accessories to their outfit for a cohesive look--so that's my goal for accessories! I get why people like the idea of capsule wardrobes--so streamlined! Minimalist! But I feel like that is what people who don't dress interestingly already wear. My workplace is a sea of black pants and black cardigans... As the "viewer" to other's outfits, I would love more colour and variety and originality. For myself, I don't want disposable clothing, but I also don't want garments to last forever. I get tired of wearing something at the end of a season. Also, I go to sewing blogs for sewing projects and fashion. I do tend to skip past posts that start introducing other content, but that is just me. Bloggers are entitled to write about whatever motivates them. I will say this has been my favourite blog since I found it awhile back! I love your colorful dresses! I find dresses are the most convenient way to add fun patterns and colors...jeans and t-shirts the rest of the time for me. I do need to work on the basics but dresses are so fun. I think that's a fabulous idea, and I can completely relate- I remember with the bra-a-week challenge having to churn things out so quickly, and I've really liked taking a step back from it and spending a little more time and thought on my makes lately so that they are exactly what I want! Can't wait to see all the beautiful things you make!